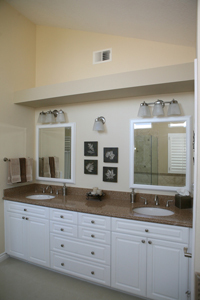 Your bathroom vanities play an integral role in your home. Whether you’re getting ready for a day at work or primping for an evening out on the town, it’s all done with the help of your bathroom cabinets, sinks, and mirrors. When you need to give your vanity a makeover, trust the experts at Reborn Remodeling Solutions. We know what it takes to turn an old bathroom into a space you’ll be proud of that has plenty of room for everything you need to get ready to face the world. With the help of Reborn Remodeling Solutions, you can transform your bathroom vanities into spacious ones that will have your family looking forward to waking up early and preparing for the day in front of a gorgeous bathroom vanity. There’s no reason to stop with just your bathroom vanities, though. Reborn Remodeling Solutions is a full-service bathroom and kitchen remodeling contractor, licensed, bonded, and insured for work in California. We can transform your entire bathroom and make it look brand new again. We can install a new toilet, shower, bathtub, shower liner, or tub liner, and take care of all the plumbing, piping, and electrical work ourselves. Trust Reborn Remodeling Solutions for all of your bathroom remodeling needs, and find out why thousands of homeowners have made Reborn Remodeling Solutions a favorite remodeling company in the Southern California area. For more information about the beautiful bathroom vanities that Reborn Remodeling Solutions can design just for you and install in your home in Santa Ana, Fountain Valley, Yorba Linda, Orange County, Laguna Niguel, San Diego, Placentia, Huntington Beach, Mission Viejo, or any other nearby community, send us an e-mail or give us a call at 1-877-371-4943. Or, feel free to stop by our 40,000-square-foot manufacturing facility in Anaheim today for a firsthand look at our bathroom vanities and find out just what The Ultimate Remodeling Experience® means. "I was very happy with my new bathroom vanity. It is just beautiful. I would highly recommend this company to anyone. A few minor bumps but it was resolved immediately. I am a very pleased customer."